by Mathew Klickstein Author · Marc Summers Author of introduction, etc. 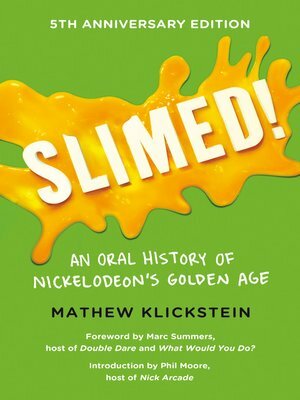 One of Parade Magazine's "Best Books About Movies/TV"
Included in Publishers Weekly's "Top Ten Social Science Books"
Before the recent reboots, reunions, and renaissance of classic Nickelodeon nostalgia swept through the popular imagination, there was SLIMED!, the book that started it all. With hundreds of exclusive interviews and have-to-read-'em-to-believe-'em stories you won't find anywhere else, SLIMED! is the first-ever full chronicle of classic Nick...told by those who made it all happen! Nickelodeon nostalgia has become a cottage industry unto itself: countless podcasts, blogs, documentaries, social media communities, conventions, and beyond. But a little less than a decade ago, the best a dyed-in-the-wool Nick Kid could hope for when it came to coverage of the so-called Golden Age (1983–1995) of the Nickelodeon network was the infrequent listicle, op-ed, or even rarer interview with an actual old-school Nick denizen. Pop culture historian Mathew Klickstein changed all of that when he forged ahead to track down and interview more than 250 classic Nick VIP's to at long last piece together the full wacky story of how Nickelodeon became "the Only Network for You!" SLIMED! is a celebration of Nickelodeon that includes a foreword by Double Dare's Marc Summers and an afterword by none other than Artie, the Strongest Man in the World himself (aka Toby Huss). After you get SLIMED!, you'll never look at Nickelodeon the same way again.